#7 - Petersburg to Juneau with Fords Terror and Glaciers Along the Way. Willie has left future Wild Blue crews numerous poultry products: duck, turkey, chicken, excetera so just minor additions were needed to the ships provisions. About mid-morning the Wild Blue with new crew departed Petersburg for Portage Bay on the top end of Kupreanof Island. It was overcast but pretty on the run up Frederick Sound. Snow covered mountain peaks fill our starboard view. 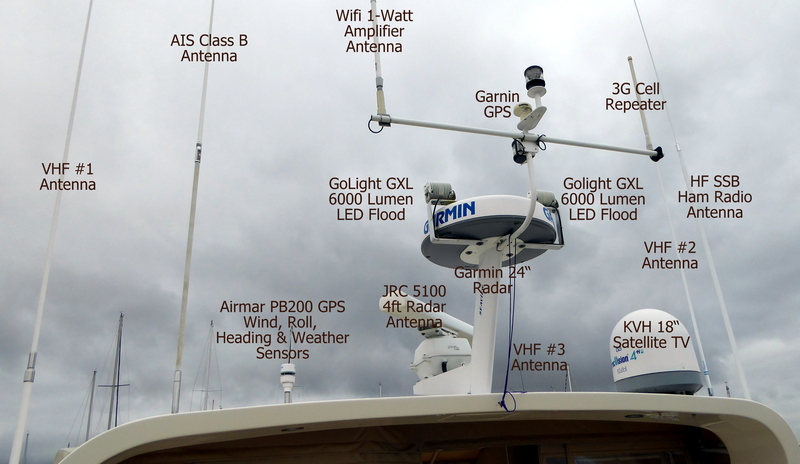 We made radio contact with the Selene 47 Maritime. Rob and crew were fishing at the entrance to Thomas Bay and we made a schedule to rendezvous tomorrow in Cannery Cove. 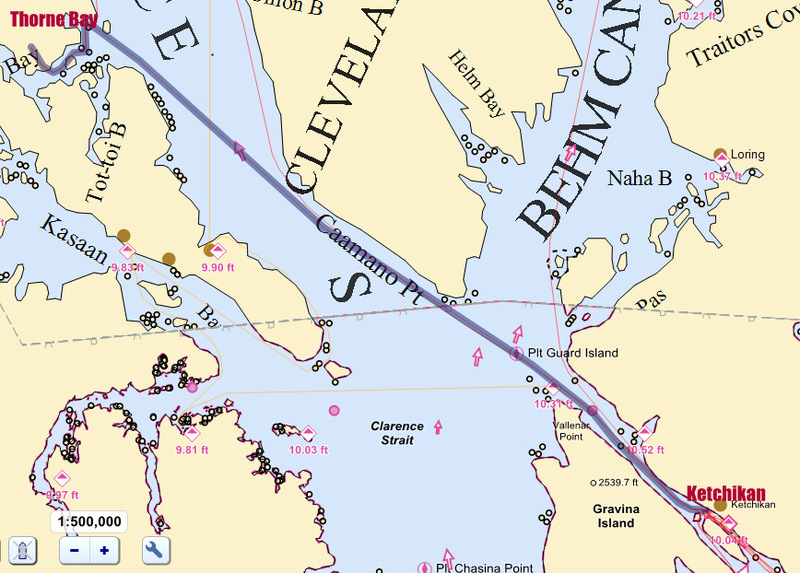 The Alaska Marine Highway is really just a bunch of ferries. This one is cruising at over 40 miles per hour. When you have lots of crab to consume, you find many ways to enjoy it. This one is Barb's melted crab and cheese. Skip Shaw and Barb Renshaw of Los Osos are this week's Wild Blue crew. We arrived at Portage Bay and set the anchor near the entrance. After a dinghy ride and 3-mile hike of the shoreline, the crew was ready to relax. This week's crew consists of two long time friends from Los Osos, California: Skip Shaw and Barbara Renshaw. The 3 of us worked together at Jacquard Systems, a small company in Santa Monica, California in the 1970's. Later Skip and Barb founded Peerless Systems, a software and systems development company and took it public. Now retired, they continue as philanthropists to the great benefit of many San Luis Obispo nonprofits. Barb prepared a wonderful dinner of fried halibut and cod fillets then we retired for the day. Scenic Portage Bay is quite a calm anchorage. The humpys were in force today and we stopped the boat to take in a whale view on our continued route up Frederick Sound to Pybus Bay and Cannery Cove. The guidebook tells us the Cove is full of crab but the previous crew has left us a 4 pound bag of fresh picked crab and it will be a challenge to figure out the various ways to consume it. This is not crab. Our lunch today consisted of Willie Bird's smoked chicken sandwiches. After setting the hook (anchor) we set off on another shore excursion. The Cove opens up to a scenic valley and snow patched mountain view. It's slow going along the rocky shore and the bugs seem to want to have us for lunch as the Alaskan sun shows itself. We take note of several large animal scats, but Barb assures us that these are elk or moose poop, and definitely not bear! After 1-hour of tromping around and wading across a few streams, were satisfied with the Cove's shore flora and fauna. The view from the Cove. Late in the afternoon Rob and crew Paul on Maritime dropped their anchor near us. Four other boats are also anchored here. They join us for a dinner of fresh crab cocktail, crab salad, and pasta with spicy crab sauce. As Paul is a retired alaskan fisherman, we have a detailed conversation about long line fishing technique. This is pasta with crab in red sauce. Chef Barb again pleased our palettes. Last night Rob of Maritime talked us into visiting Ford's Terror in Endicott Arm. We had already planned to go up the Arm to visit Dawes Glacier, but of course we were warded off by the place's name. It turns out Ford was a sailor in the mid-1800's who entered Ford's Terror but because of the strong tidal current, couldn't get back out for six hours. This story does not make the place any more inviting, but Rob assured us it is worth a visit. 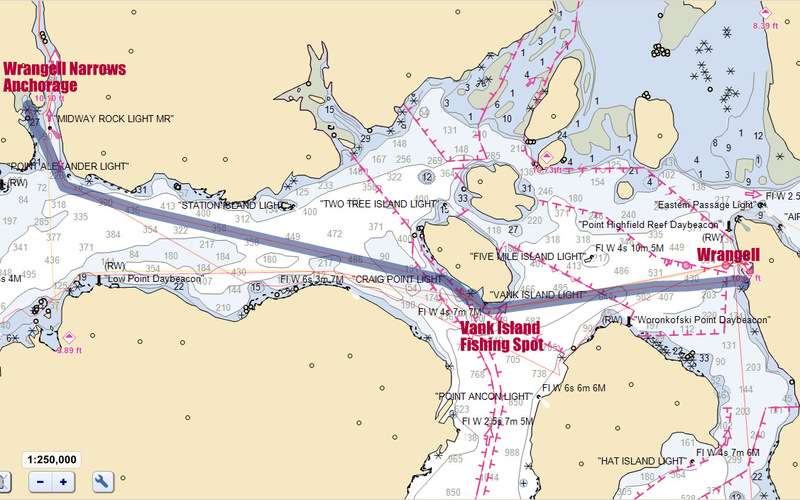 According to the guidebook, and common boat sense, timing your arrival at the entrance at slack current is critical. 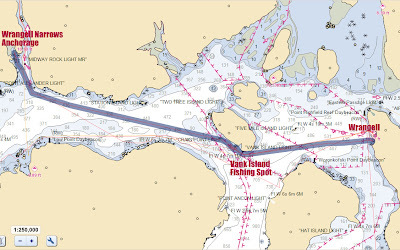 Slack current occurs approximately 1-1/2 hours after juneau slack tide. A waterfall of up to 3 feet high has been observed when you get it wrong. We departed Cannery Cove at 7:15AM to insure this from not happening, however we couldn't control our wicked imaginations. It took us 6 hours to reach the entrance to Ford's Terror. Ford's Terror Entrance is narrow and shallow. We were a bit early for the slack current prediction but the narrow entrance looked calm. We slowly entered keeping multiple eyes on two depth sounders and the forward looking sonar. As the depth shallowed to 9 feet we slowed the boat to less than 2 knots. Finally we overcame the 200 foot narrows and entered a different world. We were immediately reminded of BC's beautiful Princess Louisa Inlet: tall granite walls, numerous waterfalls, glassy water and zero wind. After another 40 minutes we set our anchor at the end of the inlet, just in front of the largest waterfall. Rob was right: Fords Terror is a spectacular place well worth a visit. Crab and beef tacos for dinner. We awoke to waterfall sounds in our spectacular quiet setting. The boat hardly moved at anchor in the still water of Fords Terror. To exit and continue our cruise, we needed to arrive at the inlet entrance by 845 am to make slack current. When we did, two other boats had already entered the inlet but we floated out at high water slack current without incident. We then continued further up Endicott Arm to the Dawes Glacier. About 3 miles away the ice chunks became more dense. From previous experience we learned that when cruising close along the either side of the arm, an ice free path can usually be found. Such was the case today until we were within a mile of the glacier face. Then it was all stop and slow going with ice pole crew on the bow. Skip did an excellent job of pushing the bergy bits away from the hull until the next ice free path was discovered. We made our way to within 1/2 mile of the glacier face, but the ice was thick and the nursing seals were embarrassed and bothered, so we kept our distance. The seals rear their babies here on the ice bergs away from the waters and shores with hungry Orca whales. Suddenly we saw a large section of ice calve off the face. Then we heard the big BOOM! The falling, house-sized chunk of glacier fell into the sea, creating a mini-tsunami, These big waves churned up the surface causing floating ice to rattle against each other, much like shaking ice in a drink glass. The waves then ricocheted off the walls of the arm. It was like being in a washing machine, without the soap! After a fun-filled day of battling ice bergs, viewing seals and watching a moving glacier, we exited Endicott Arm and anchored in Tracy Arm Cove. These seals raise their young on the ice. They get a great view of the glacier, plus their babies don't get eaten by the Orca whales. "Hey mom I'm hungry. Lie still!" We spent a restful night with three other boats including the Selene 53 Morning Star in Tracy Arm Cove. It's the best anchorage near the glaciers so most cruisers include it in their itinerary. 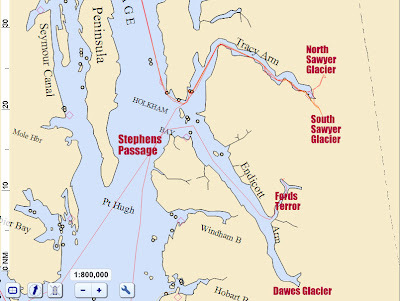 Today we want to see more glaciers, so we will cruise up Tracy Arm to the Sawyer Glaciers. Hopefully the ice will allow us another closeup view. It's a 3-hour tour to get to a Y-intersection near the glaciers. One turns right for South Sawyer Glacier, or left for North Sawyer Glacier. A local tour boat alerts us via VHF radio that the South fork has only a few dense ice spots. That and the fact that the North fork has always been stuffed with ice on our previous visits, means we go for South Sawyer. With careful boat handling and Skip's new found adeptness at keeping the small bergs at bay, we are able to get within 1/2 mile again. After viewing the South Sawyer for 40 minutes we backtrack through the ice to make our run up to North Sawyer. On the way our new tour boat friend calls to say there is clear water just past the Y-intersection. Yippee! It's time to land some glacier ice and celebrate. We land our own piece of glacier ice berg. It's a genuine "bergie bit". What's a 10 over 10,000 cocktail? : That's 10 year old Grey Goose vodka over 10,000 year old ice! The face of North Sawyer Glacier was nearly ice free. 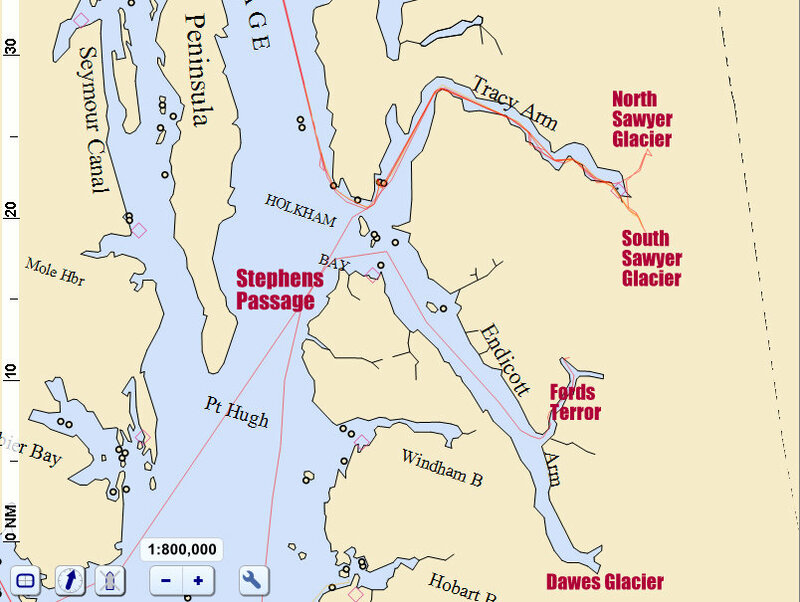 After another great day at the glaciers, we head down Tracy Arm, past Tracy Arm Cove and up Stephens Passage for Taku Harbor, our last stop before Juneau. Along the way, the Orcas come out to play, completing a great Alaskan experience. Portion of the old cannery at Taku Harbor. Old cannery equipment is now picturesque. The piles that once supported a large Alaskan cannery. A few cruise boats gather at Taku Harbor near low tide. We complete the week with a leisurely 2-hour cruise to Juneau and tie at the Intermediate Vessel Float in the center of downtown. It's been a fun week reliving old times with Skip and Barb while enjoying the sights, tastes and aromas of Alaska. Alex was leaning against the wall at the Seattle to Ketchikan gate, when two old guys approached. The guys said hello, waiting for a response, as it took a few seconds for Alex to realize these old guys were his college roommates up for another cruise on Wild Blue. Willie and Mike had arrived together from San Francisco. Willie is a turkey rancher and Mike owns a CPA and audit business. A few minutes later Joe, another college roommate and chicken rancher, joined the group arriving from San Diego. The group has been cruising together in Alaska and British Columbia during the past three summers. All four graduated from Cal Poly San Luis Obispo in 1971 and all now are aging gracefully..... sorta. After landing in Ketchikan the college crew dined at Annabelle's alongside a handful of cruise ship passengers looking for something not found aboard. Willie has been feeding everyone else ever since those college days and once again he arrived with a large cooler packed with product. Smoked turkey, smoked chicken, duck breast, prawns, turkey bacon, chicken wings, lamb steaks, baby shrimp and Cajun spices were tightly packed into the giant cooler. This bag was definitely overweight and costly to check. Needing just a few more items, the crew final provisioned at Safeway for a week in the Alaskan wild, as wild as the Wild Blue can get. After just a few libations, the gray haired crew retired for tomorrows cruise to Prince of Wales Island. By noon the Wild Blue was off in a northwesterly direction towards the northeast coast of Prince of Wales Island. 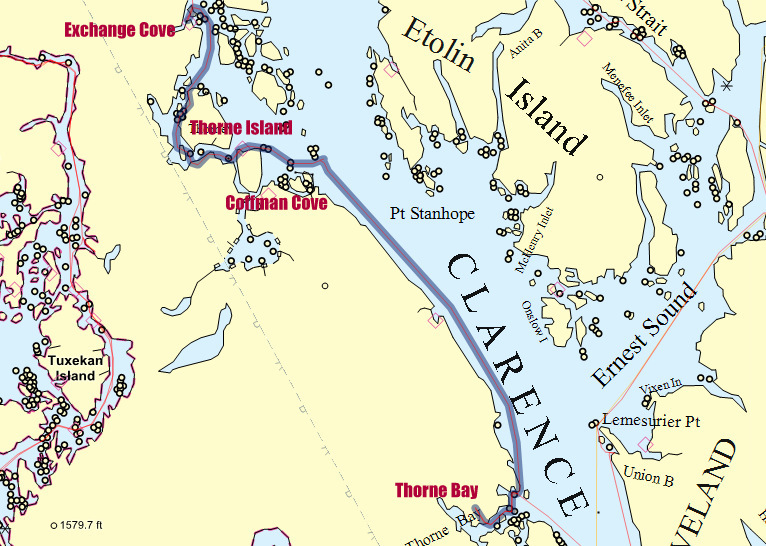 The course took us up and across Clarence Strait to a small town on well protected Thorne Bay. 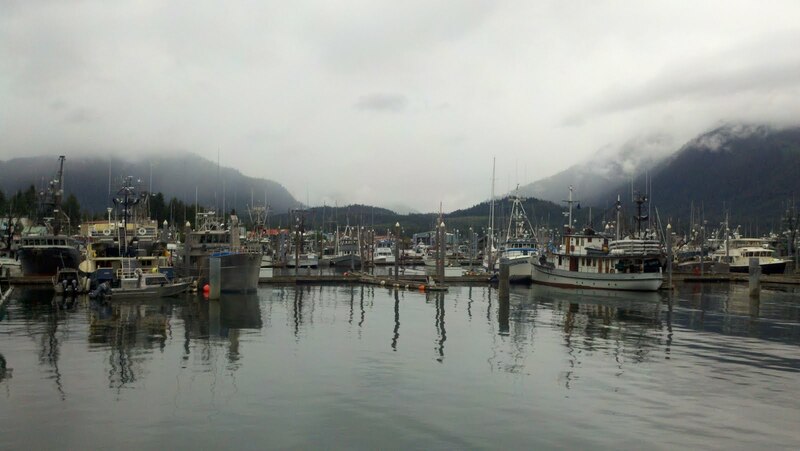 The town harbor was quiet and Wild Blue secured moorage at the transient dock. With $220 recently spent on licenses for 7 days of Alaska fishing, the crew immediately launched the tender boat and placed two crab traps for an overnight soak. Willie then created his New Orleans spicy gumbo to the delight of many a taste bud! Chicken Rancher Joe knows too many girls means the roosters will get tired, but crab ranchers only harvest the males. These three small prawns were relished and consumed. 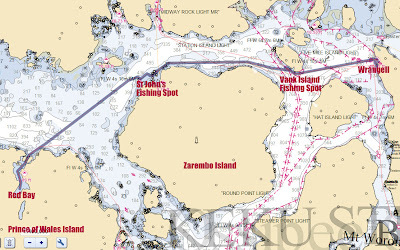 Today we fished the northeast coast of Prince of Wales Island on our way to Exchange Cove. 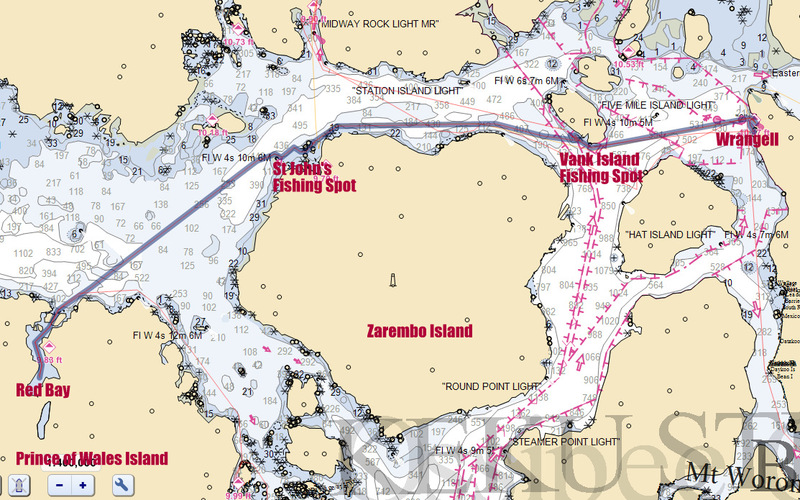 We choose fishing spots near rocky outcroppings in 60 to 100 feet of water. We also employed the sonar to assist us. After locating what appeared on the sonar to be amazing fishing spots, we had no bites, hookups, and our fish box was empty. The sonar shows a crowds of fish down there, but none seem to want to ride our hooks to the surface. (Note: The water temp really wasn't 111 degrees. It's a sensor issue). After what seemed like hours of tedious fishing, actually it was several hours, we arrived at Exchange Cove, dropped two crab traps and our anchor. 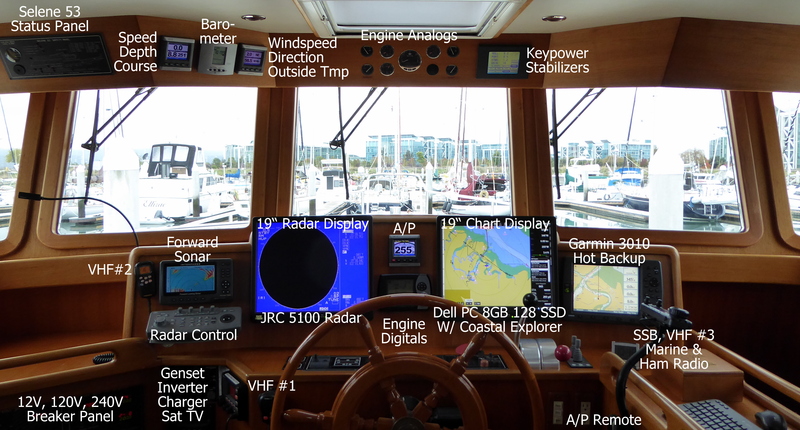 This is a beautiful and large anchorage with easy access. The water is calm. We decided to fish in the shallow 24 foot depth and were surprised to get a bite. Willie reeled up a large crab, that promptly fell off the hook, a promising sign. We didn't wait too long before pulling our traps and reaping our reward. Willie prepped a spicy seawater boil and cooked all twelve large male crabs. We stuffed ourselves with warm cooked crab dipped in garlic butter, then picked the remaining crab meat for storage. Awesome! At anchor in Exchange Cove. Twelve large male crabs take up space, These claws are ready for cooking and dining. Willie is at home in the galley displaying 1/2 of large crab, ready for boiling seawater. Wednesday - June 15, 2011 - Exchange Cove to Red Bay: Epicurean Delight. On Wednesday we continued our bottom fishing ways around the top of Prince of Wales Island. And as before, the fish stayed in the water. 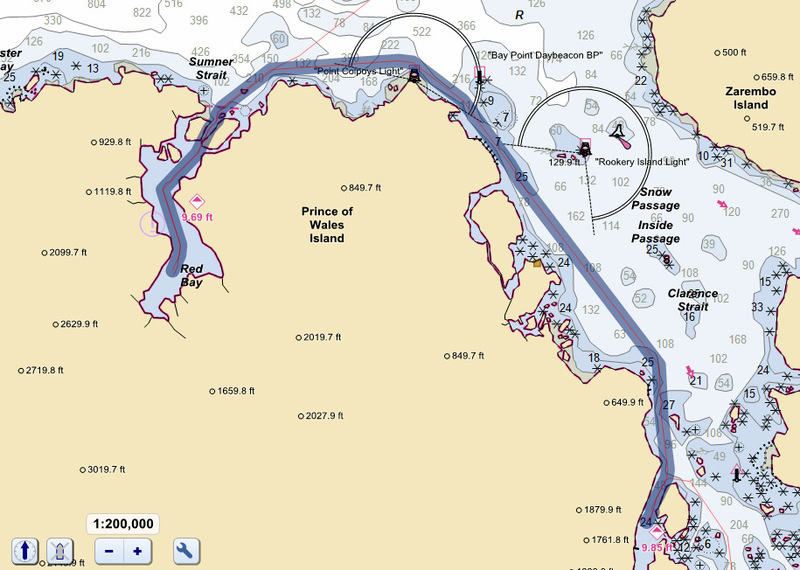 We entered Red Bay late in the afternoon near slack tide to navigate two narrow channels inside the Bay. After a long day of fishing, we dined on crab salad and Willie's own grass fed lamb chops. After that awesome epicurean experience, some of us even finished the last episode of HBO's War in the Pacific. Hopefully the fish will bite tomorrow. Thursday, June 16, 2011 - Red Bay to Wrangell: There are fish in the sea. The sun appeared for the first time in several days. We cooked up the remaining crabs and decided to pick the meat for easier storage. Then we will continue our fishing ways on the way to Wrangell. After picking the crab, the boys are ready for reel (or real) fishing. Alex stops the boat outside St. John Harbor to fish the rocky points. After an hour without excitement we move onward toward Wrangell. Alex stops again off the south end of Vank Island, about an hour outside Wrangell. Finally Willie gets a byte and pulls a small ling cod. After returning the juvenile fish, Alex and Joe return similar fish. Willie's "Well you caught something" didn't really help our mindset. Then Willie got a big tug, the pole bent good, and he eventually landed a good-sized fish which we learned was a Pacific Cod. Mike then promptly landed a larger Cod. And as if that wasn't enough, he then reeled in a 36" halibut! At last the fish were biting but after a busy hour, we cruised into Wrangell, docking at the new Heritage Harbor just south of the downtown. Always one for the spotlight, Willie shows off Mike's halibut for his local newspaper. The makings of a crab salad. Of course lettuce, tomatoes and onions are optional. Wrangell always reminds Alex of the "Leave It To Beaver" set. Moored on the float next to Wild Blue were three other Selenes: the 53 Peregrine, the 53 Tranquility and the 59 Raindancer. Once again we awoke with full bellies, our breath reeking of crab salad, fried fresh cod and halibut. We decided to work our way to a point near the entrance of Wrangell Narrows and anchor for the night. 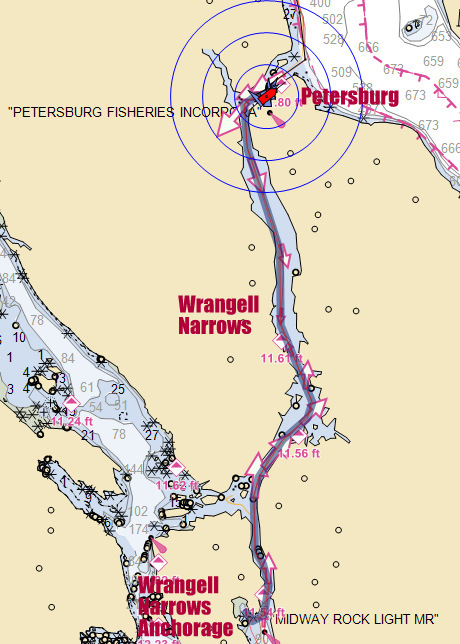 This would give us a leg up for entering the Narrows and making Petersburg earlier on Saturday. Soon after leaving Wrangell the Alaska Marine Highway, in the form of a ferry, passed to starboard. We fished our hot spot again, but it was now cold, I mean frigid! We anchored in a cove near to the southern entrance to Wrangell Narrows and planned another seafood feast. 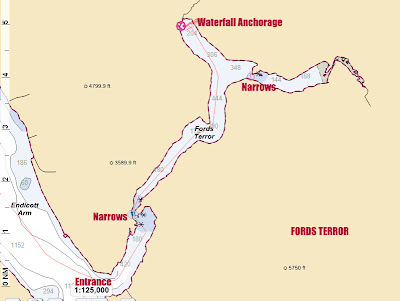 Wrangell to Wrangell Narrows Anchorage with fishing stop. 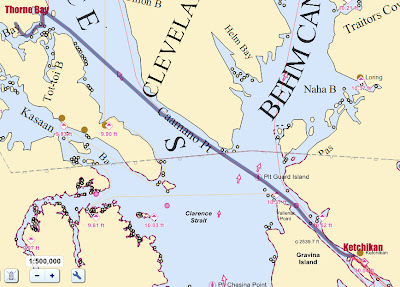 The Alaska Marine Highway is really a ferry. Yet another way to dine on crab: Crab cocktail. How about crab cakes? But what about the other 5 pounds in the refer? Saturday, June 18, 2011 - Petersburg: La Fonda for a Mexican Fix. 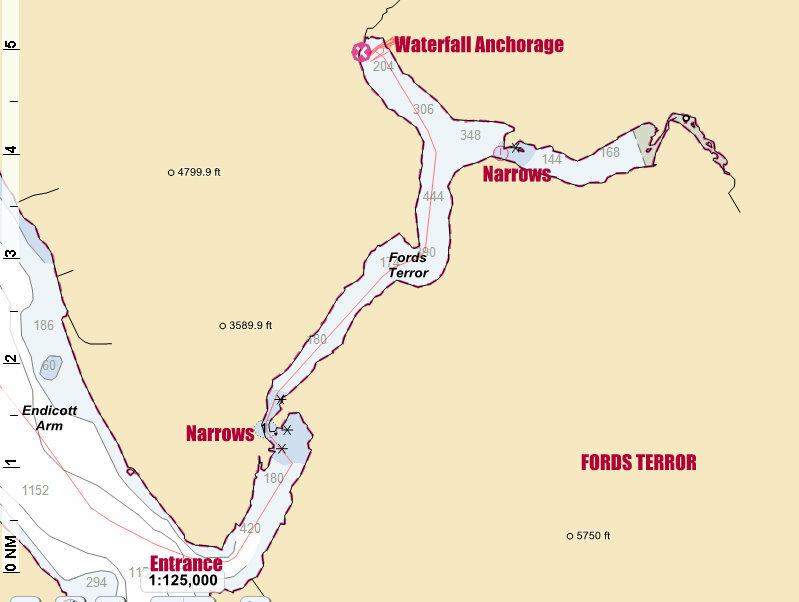 Usually you want to enter Wrangell Narrows at the end of a high tide cycle. That allows the boat to be pushed up the Narrows until reaching a mid-point, where the tidal current reverses and pushes the boat some more. Since high tide occurs late in the day, we decide to buck the current by entering at the end of a low tide at 9AM this morning. This puts us in Petersburg in time to enjoy this Norwegian rooted town. We start up the Narrows with a 1 to 2-knot current against us. At 10AM slack we are halfway there and the current is zero as expected. 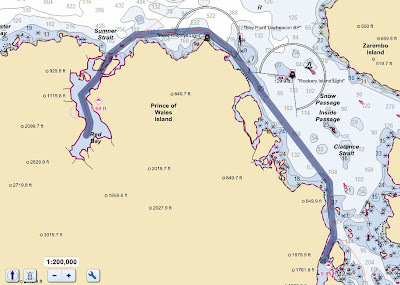 By 11AM we are nearing Petersburg with just a 1-knot adverse current. Not the optimum approach but good for this day. Once there we head for a town tour and visit to La Fonda, a Mexican restaurant inside a bar. The food is great but as you might guess, no one orders seafood. It's been a fun week of reliving our college experiences. Some of the things we did back then seem quite absurd today. The college crew is looking forward to another year and another cruise. Just had to have one more fresh fried fish sandwich! Petersburg South Harbor is filled with fishing boats. Wild Blue is on the far right.